In My Head Studios: The Owl Eyes Have Spotted Me! The Owl Eyes Have Spotted Me! 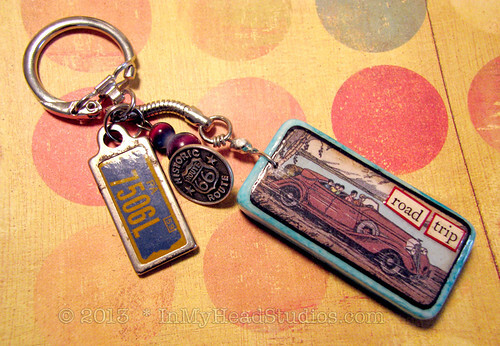 A few days ago I was contacted by a very nice student from the University at St. Andrews in Scotland asking if they could use a photo of my "Road Trip" Domino Keychain for an article about a trip through the southwest of the United States. 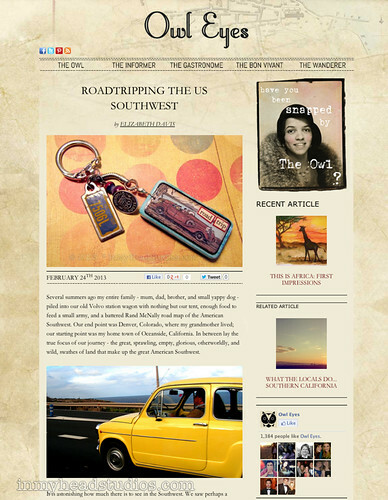 Of course, I was thrilled to be asked, especially after looking through their wonderful online magazine called Owl Eyes. The writing is excellent, and it is a fascinating look into life at "uni" in Europe. St Andrews is Scotland's first university and the third oldest in the English-speaking world, founded in 1413. They celebrate their 600th anniversary this year! 600?! Wow! I highly recommend reading some of the articles to get a feel for the life there. The Big Top Ball is a good read and shows how different US and European colleges are in relation to student activities (and drinking on campus). Reading through the article That Time I Went to A 65th Birthday Party In Spremberg had me laughing! How I would love to hitchhike in an event sponsored for charity! That doesn't happen here in the States. It makes me want to go to University at St. Andrews! Or at least visit Scotland - that is on my bucket list. I'll need an amphibious car to make it a road trip, though! Without your comments, I'm just talking to myself! Say something before they come to take me away. Ha ha, ho ho, hee hee. Facebook Called! They Said You Will LIKE Me! This is a Flickr badge showing public photos from In My Head Studios. Make your own badge here.